…what appeared to be someone’s basement. One of them sank gratefully down on an old couch which prompty collapsed. I tried to hide my smile. “A totem, or tribal fetish,” said one, walking around the center of the room. “It could be a work of art,” suggested another. “Not much help when there is only one way to go,” put in another. “I tried to hide my smile.” – This wouldn’t be the rhetorical use of a “simile” or metaphor, would it? Is the couch pictured here (among other rooms in which furniture appears) have anything to do in regards to Sellisternium or Lectisternium? If the remaining part of Room 3 requires you to flip and mirror-image the room, then it seems like the three hooks in this room might be hinting at that. You have two hooks that are mirror images of one another, and then one flipped upside-down (or right-side-up) — the coat-hook. This really works but I am not adding it to the summary until someone solves this riddle in Room 3. Ack! Someone solve that final Room 3 thing. It is driving me crazy. Perhaps that Humble Cleric fellow? This room is now five out of five but take this with a grain of salt I’ll bet there is more here. In addition to all the three-y things here, there’s the stick hidden under the left hand side of the couch that looks a lot like a drumstick – the drumsticks in 33 point to door 3. I’m still pretty stuck on the idea that the pockets of the coat look like the 8 in 81/18 in 3. No other 8s look like that in the book. And the fact that there’s two of them like mirror images works for the door in 3, the mirror image room. There’s the obvious fact that the totem in 35 looks like a man made out of sticks, and he has a single bulb glowing behind him to his left. This matches the stick man and sun in 3 indicating door 81/18. There are the matches and lots of flammable material in 35, which also makes you think of the fire, and 13 is the door closest to the fire. There are the two couch cushions remaining on the couch in 35, which are square like the shape of the chair seats here. The one on the left is closer to us than the one on the right, just like the chairs in 18. Something going on with the stick man in 35, who is hatless, the stick man in 3 who has a hat, and the ownerless hat here? Not much for this one. The lamp with lightbulb points the right way and matches the lightbulb in 35, maybe (also pointed out by vewatkin). Something with the sundial and the circle of light in 35? Don’t know. Who knows. But another top hat guy with a stick is trustworthy here… his baton starts the trail of pointers to 41. Maybe that’s what the stick under the couch is? An actual totem beside door 1, with X marks the spot. Does that X match the X made by the two front legs of the room 35 totem? Most productive Mazecast ever! Four potential solutions in one post! Also, I thought that this room probably only helped with the next three rooms but y’all’s idea about the bulb in Room 13 made me realize that this room is helps solve an as-of-yet-unsolved puzzle Room 13 as well. I am happy crediting “Mazecast,” let me know if you want personal credit instead. Nice sleuthing everyone! Great job! MAZECAST this Thursday evening to discuss Room 35 and various other things! We’d love to have you join us. 515? Kon-Tiki? MIT10? Shelley? Any of you Mazeheads out there. If you’re interested, contact us through the Mazecast site. This is a pretty weird thing to do because it breaks out of the conceit that Maze is a house, not a book. This isn’t something the visitors to the house could actually do. BUT we’ve been told by WR (somewhere) that 35 is a little different. Anyway, the original idea was that you would look through the white space in 35 to see what’s in 34. Put the two pages together and look at them with a bright light behind. (You have to actually look through the text from page 36 to do this if that makes sense. Or you can look from the 34 side and see what’s in the white page “frame”.) But that just gives you “YES.” Maybe a confirmation that you are doing the right thing? When you look at the two pages together like that, the idol is pointing directly at door 10 in 34, the correct door in that room. Interestingly, if you overlay 35 and 36 and look at them together in front of a light source, the idol is once again pointing at the correct door. Suit JACKET… crumpled up PAGES… a match BOOK… all things indicating we should be thinking about Maze as a book in this room? Howdy all, did I miss anything? Haha, nice work on the guide path! This room still drives me nuts, but all this catching up reading about trefoils got me thinking. The totem has 3 legs (the 4th leg is against the wall). The couch seemingly has 3 legs now that it collapsed. And that side table, weirdly enough, seems to have only 3 legs – the back leg against the wall should be visible at this angle, but isn’t. There also appears to be something that looks exactly like the side table legs leaning in the doorway, just above the room number 35. So 3 objects with 3 legs. Which needlessly clues door 33. Except in Maze, even two 3-legged objects could clue 33. So maybe the extra one clues Door 3 in the next room. - There’s a light hanging, and a suit hanging. - There is a lot of what looks like crumpled up pieces of paper in the box in the corner… maybe that blank poster on the wall is one of those giant tear away paper sketch pads. - The ladder (weakly) suggests blank letter spaces you might find in hangman. - Random tennis wordplay. We have a point (the totem), a set (the suit) and a match (the, um, matches). All we’re missing is a game. So many 3 things. Others have pointed this out too. Is it just unnecessary clueing of 33? Or is it meant to tell you to take door 3 in the next room? None of this has gotten a peep out of WR. Maybe it’s another hint to look for three-ish things to get to the Guide Path? In addition to the three-legged things you mentioned, there’s also the three-button jacket, the spring that looks like a three, the three hooks, and the three sofa cushions. Totally agree with you on the hangman vibe, just no idea what to do with it! I think that long post against the wall is probably the missing arm rather than a missing leg. It hadn’t occurred to me that the small post in the doorway is the missing leg of the bench but that works for sure. The only other room like this, Room 6 has two purposes, the riddle of the guide and helping a visitor make the right choice… in the next room! This room is about the rooms coming up with riddles to help someone escape The Loop. These riddles offer subtle hints for (at least) rooms 33, 3 & 18. Nicely done 515! This room is out of the doghouse! Whoa, this is pretty cool! And some pretty big hints here from WR. For room 18, you have the bass clef shape in the couch arms and spring (found over the correct door in 18), combined with the blank poster, which you can juuuust see in the doorway to 13 in 18 (first pointed out by Dave G, I think). Also, regarding the suit and White Raven’s note about toggle buttons. I’m not sure I agree those are toggles — they just look like button holes to me, as if the suit is hanging unbuttoned. Regardless, it is the style of suit called a “three button suit” to distinguish it from a one, two, or four button suit. I looked REALLY closely at those toggles/button holes and you are right, it could be button holes. The toggles/holes are just a single line marquise-like shape in the drawing which is how you would draw either when you are not adding much detail, and so I removed “(it could be coincidence but the toggle buttons on the suit are typical of a mid 20th century “traveling suit”)” from the summary. Thanks for sharing your doubts! Yes! I used to think that the clues only helped with rooms 33 and 3 until recently when Dave pointed out the poster. Since then I have found stronger connection to room 18 but one I hadn’t noticed was the base-clef-like arms of the couch. Nice find! Anyway, I thought it was interesting enough to point out, though not apparently meaningful, that 35 and 6 are only functionally similar (in the sense of having only one exit) but have very similar surroundings. 6 exits to a room with three exits and an unmarked door; off of that room is a three-room closed loop. 35 exits to a room with three exits and an unmarked door; off of that room is a three-room closed loop. These are the only one-way rooms, and the only three-room closed loops, in the Maze. Well, the loops aren’t completely closed, you can head back to the room that leads to them. Maybe they’re better described as cul-de-sacs. Does anybody see any hidden, or not so apparent, objects in this room besides the Bass/F clef on the sofa? This room keeps blocking my trails. There’s a bench hidden in the shadows by the wall. Do I see a “3″, or maybe a “30″ hidden in the springs on the couch? Not that any of this does anything useful. I thought I was onto something. Maybe it’s been mentioned…. We know that “felt” in the text signifies “left” as the correct door in all 3 instances it appears. Did we know that “left” in the text signifies “right” as the correct door 5 out of 6 instances? …the only outlier is this one, and technically, it IS the right-most door. The other rooms are 9, 16, 20, 32 and 44. People have talked about this for sure but I’m not sure where or what the conclusion was. This analysis is pretty good! A cursory review suggests that where the word right appears, the correct door is on the left side of the room. The exceptions are the rooms in which both right and left are mentioned: 9, 35. And, actually, 35 isn’t an exception at all, I’m just putting it down here because it mentions both left and right. 9′s an oddball, then, in this scheme, but that’s sort of a necessary consequence of using “right” and “left” in the text in a room with more than one door. But it at least seems a fair hypothesis that where the text simply contains a directional indicator of “right” or “left,” that indicator is meant to mislead us. I mean, we know it DOES mislead us, but with this many occurrences of the phenomenon, it seems fair to suggest it’s deliberate. I am just noticing a bunch of stuff here, but I am not very perceptive as to hidden meanings so looking for help. 1. Why is the suit new, clean and on hanger like it is brand new or recently cleaned when this room is so dilapidated and looks like no one has been in it for years? Also, no dust on anything, however dust would be hard for Manson to draw so that isn’t a huge deal. 2. There is a sofa cushion in the 33 doorway. 3. Why would anyone put a sofa in front of the entryway (assuming the visitors entered from the ladder)? 4. There is a circle of light around the “thing”, and the Maze doctrine Light= ;) reinforces the idea that the “thing” is a clue, guide clue or room clue I don’t know. I’m seeing an R and a 6 in the suit or am I just being silly? The couch (obviously) has been used many of times, since it collapses after a guest merely sits on it. The light bulb is right above (or fairly close, it’s hard to tell) the couch, so maybe it was worn down because someone was constantly standing on the couch to turn the light on and off. I think I might have an idea why. The box of papers have been crumpled and thrown in a heap, so the were “rejects” of something. When is two of the only times you hold paper up to light? …or it just doesn’t mean anything and that’s just a light bulb. Did I just ramble? Well, let’s all start burning our books. The box of papers in the corner by the couch does look like a great kindling point-the matches could start the fire that would be an ARSON. As I have posted Cop-L-Hanger/Doppelganger/Doppler(sound). That would give us Arson that anagrams to Sonar(sound). Yes, the five star rating is for non-guide related solutions. So far we have only used two metrics, one for clues to the next room, the other clues to the Guide. 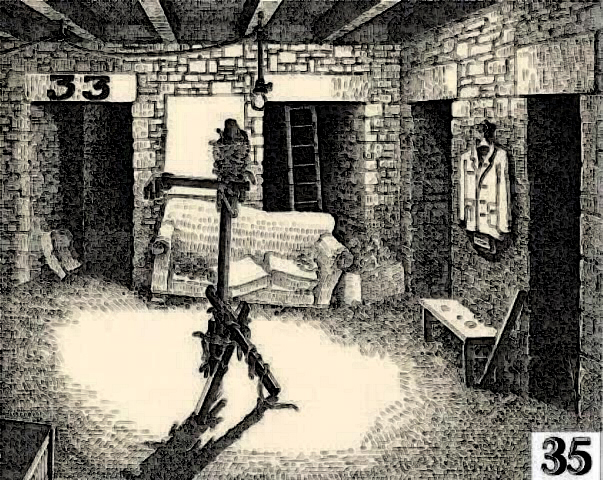 I am forming this question to be answered yes or no so that WR doesn’t have to give anything up: since clues to 33 would be redundant, are the clues in this room pointing to a third metric (such as a clue meant to work for another room)? Hmm, maybe that doesn’t make sense. A clue meant to be used in a different room is still a room clue (first metric). I will assume it’s that. The way the question was phrased, it could just mean a room clue for down the road, general route guidance, “wrong way,” “start over,” etc. But 35′s a little different, hmm. Anyway, a good take away here is that the Guide Room (man, I love capitalizing phrases) at the end of the Guide Path will have some other kind of clue/s as well, unless it’s Room 24; though, since WR said “there is nothing really [in Room 24] to solve,” Room 24 doesn’t seem a likely candidate. So the thing has a V. From the other side a lower case R. If we are bringing the wood over to make 3 legs as I think we are supposed to we could also use it to make an A or an N. 33 is backward E’s of course but there is also that ladder and in room 37 W R likes the idea that a ladder can be an E and maybe this is why. I like the bass clef – dunno if it is a thing right now. I like the 3 stones – and think they are a thing. I have a pretty well developed theory of Maze time on my page – not years apart – but the rooms for which there is a specific time cover 1 24 hour day, and 3 cycles of the 8 letter maze clock in room 30. 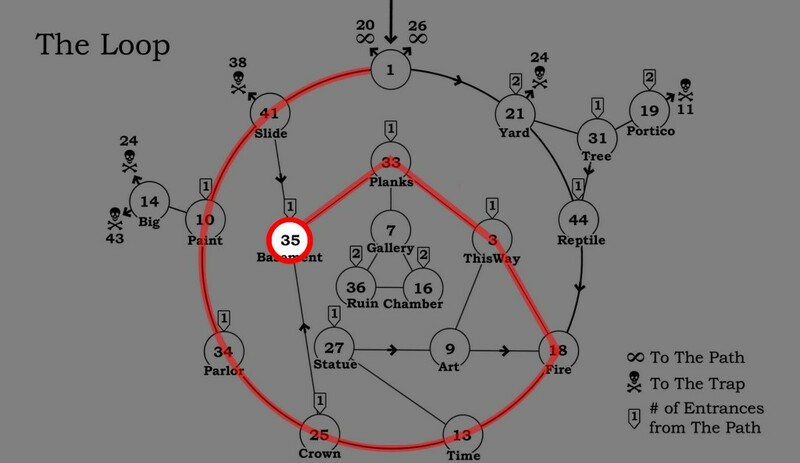 33 is the earliest room , deep in the loop, then time moves forward one hour per room around the loop and then around the 16 step path. An exception is room 41 and 1 which they apparently move through quickly, and the text says so. Rooms 10 and 42 are 16 hours and 2 cycles apart – which seems to mean they take place at the same time in some sense. Not to my knowledge. Elaborate. But I see the basic idea. I’m thinking of missing body parts that you have to put together… the “trunk” in 10, extra legs on chairs and tables… you guys were talking about fingers earlier… feet… the stick man in 3 perhaps as a model… OK I need to think this through more. This is a basement and there is a bass clef squiggle on the left side of the couch. Anything? Anything? OK, no, it seems like a basement but isn’t actually a basement. But therefore the word in the text seems even more significant. The idol here, the big blank poster it overlaps, the ladder, the tilted stick — is there a way to see 6′s beam, warning notice, ladder, tilted stick, as a sort of reversed version of Room 35? It’s not a very precise matching between the rooms, but it strikes me that there are so many similarities, and the hanging paper in 35 and the hanging notice in 6 hadn’t been mentioned, to my recollection. The idol is a straight board with two offshooting boards, and the beam in 6 is similar to that, but upside-down. The “40″ in 6 that looks like “4 of diamonds” — could that connect to “match suit?” (I am really hung up on the matches and the suit. So clearly a thing. But what???? There are strings holding pictures in 41 and 10, a power cord and string in 14, ropes on the ship in 34, a power cord in 13…not seeing anything in 25…curtain is tied back in 18…nothing in 3. The holes in this pattern, and the fact that I have to conflate so many different kinds of things…nnnnnnn. Actually dreaming about Maze is one of the more productive ways to go about solving it sometimes – lol. I often find that if I am focused enough on it I wake up simply knowing something new about it. YES vewatkin, strings and cords — I am really with you on this one. I have been working on it too but have not come up with anything very illuminating. (This is partly why I was so excited about that thread that now appears to be a printing error according to WR’s investigations.) Note that the violin in 33 is missing a string.